The Report Tool generates reports of server configurations and phone inventory reports for Cisco Unified Communications servers. Reports are generated through a fully automated process and can be exported into Word, HTML, Excel, CSV and CHM formats. Typical usage for the Report Tool are configuration reports, audit reports and phone inventory reports for system integrators to document a system to be managed or the final handover documentation for a greenfields UC build. Internally within organisations, the Report Tool is used to maintain Cisco UC related configuration details and device audit information. CUCM reports can be audited by comparing two reports to highlight any changes done to the system. Phone Inventory reports include all phone configuration details, serial numbers of phones (for example for SMARTnet renewals), registration status and switch port neighbours. What doesn't the Report Tool do? What server versions do you support? 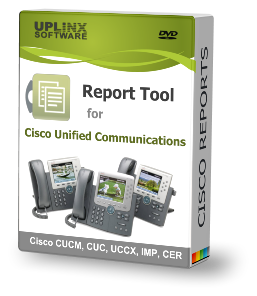 The Report Tool supports Cisco UC version 6 and later and all subversions. This includes reports for Cisco Unified Communications Manager (CUCM), Unity Connection (CUC), Unified Presence/Instant Messaging (CUPS/IMP), Cisco Contact Center Express UCCX, Emergency Responder (CER). CCMreporter supports CUCM version 4.1, 4.2 and 4.3. Which servers are not supported? Cisco UC version 5 and all Cisco Unity versions are not supported. What is the CUCM load during report generation? The CPU load will increase by about 10%. If the current CPU load is below 30%, generating a report will not impact any of the CUCM functions. If the CPU load is higher than 30% it is recommended to run the report generation outside of office hours. What report formats are generated? Reports can be generated in the following formats: HTML, CSV, Excel, Word, CHM. Is Microsoft Word required to generate reports in Word format (.doc)? Yes, Microsoft Word 2007 or later is required to be installed on the same PC as the Report Tool to generate Word reports. When trying to generate a Report in Word format the report fails. VBA support must be installed and enabled in Word. Please follow the Report Tool user guide to prepare Word. Is Microsoft Excel required for Excel and CSV report generation? Can I have a trial version? Yes. We encourage you to evaluate the Report Tool before you purchase it. The trial version has all the features of a fully licensed Report Tool install but some fields are invalidated. Do you give out full licenses for testing? No. For evaluation purposes, we provide a trial version which has full functionality except that some fields in the report are invalidated. We issue about one update per month. New features, bug fixes and support for new versions of Cisco servers are included in new versions of the Report Tool. Release notes on our website will indicate what new features have been included in a release. When will you support version X of CUCM, CUC, CUPS, CER? We participate in Cisco's beta trial program and start developing as soon as a new version of UC software is made available. At FCS (First Customer Shipment) of a new version by Cisco, the Report Tool includes support to generate reports for this new version. Can I have a quote for my business? Yes, please contact and include your address details. Alternatively, you can directly purchase the software using a credit card from our payments portal which displays the costs for the different available licences. How is the Report Tool licensed? The Report Tool has the following licensing options: Basic (CUCM only reports), Standard (for one cluster and all associate UC servers), Professional and Enterprise. The Standard version is for one reporting client and one CUCM cluster which is defined by the IP address of the publisher and is bound to the CUCM major version. The Professional and Enterprise license are not limited to a particular cluster. The Professional license contains one report client license and the Enterprise license contains up to 12 reporting clients. The reporting client is the PC or server which has the Report Tool installed and is identified by a unique node id which is generated by the Report Tool. Basic license allows only CUCM reports (CUCM configuration and phone inventory reports and CUCM audits) - all features are included in every license type. I have a standard license, can I have a new license for another CUCM IP address? No, the Standard license is bound to the CUCM IP address. There is an invalidate procedure to deactivate the active license (for the old CUCM IP address); please contact for this procedure.